I believe these images are verified as accurate. According to these images, I would say the first video looks like an actual photo of the prophet…not the second video. Does anyone know anything about the accuracy of the first video of whether or not it is truly the prophet? 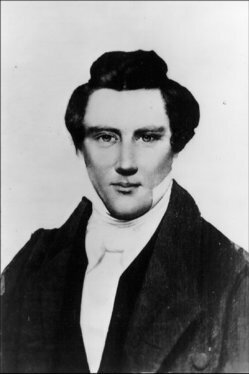 It is not a photograph of the Prophet Joseph Smith. A character going by the name LDS Anarchist started promoting it as a Joseph Smith image earlier this summer. You’re looking at a photocopy of an unidentified daguerreotype he saw in a Brazillian-published book about the history of photography. He sent a copy of it to LDS Archives all excited because he had found the Holy Grail. They yawned, and stuffed the page into the file of umpteen-hundred supposed Joseph Smith photos that have been sent to them over the years. There is nothing but wishful thinking to support the claim that this — or any of the many other purported photos floating around online — is an image of Joseph Smith. Thanks for the clarification. So do you know which paintings are actual ones of the prophet then? Are these paintings I put up accurate? I think that you can find most of those paintings on the church’s website. I’ve certainly seen them all in Sunday School/Seminary, etc. so I think that they would all being considered renditions of the prophet.